Cream for daily care of all skin types, based on beeswax and the extract of fir branch. 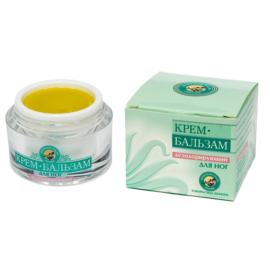 The cream actively moisturizes and nourishes the skin with vitamins, microelements and organic fats, restores elasticity of the cells and subcutaneous vessels, improving blood circulation. It softens the wrinkles and prevents their premature appearance. Fir extract has beneficial effect on the nervous system, reduces pain of neuralgic character, with radiculitis; is helpful in case of radiculitis and relieves general tension by improving nutrition of the tissues. The antiseptic properties of beeswax, cedar resin and fir contribute to the healing of any skin injuries and wounds. With regular use, the cream enhances the protective function of the skin, making it less sensitive to the influence of harmful environmental factors. Allergic reactions and other side effects have not been found. Cream for daily care of all skin types, based on beeswax and the extract of fir branch.